Not only was the Ironbound rich in an ethnic mix from all over the world, it produced well-known individuals such as Charles Evans Hughes, former chief justice of the U.S. Supreme Court, who attended Lafayette Street School; Joseph McKee, former mayor of New York City, who was born in a house on Van Buren Street; and 19th century writer Thomas Dunn English, author of Ben Bolt. Local characters that any 19th century novelist would have loved to have woven into a story also emerged from the Ironbound. Among them were Curly Med, a black-eyed beauty who owned a fleet of rental boats on the Passaic, and Clam Eddie, a street seafood vendor whose wailing voice brought housewives to his roving pushcart. Besides the masses of immigrants and abundance of individual characters, industry and commerce made and continues to make the Ironbound an important part of Newark's past, present and future. For more than a century and a half, industry and commerce have flourished in the Down Neck area. Excellent transportation, a skilled work force, and the availability of raw materials have made it a good place to do business. Industries old and new, large and small, heavy and light, have made their mark and contributed to the common good of Newark. 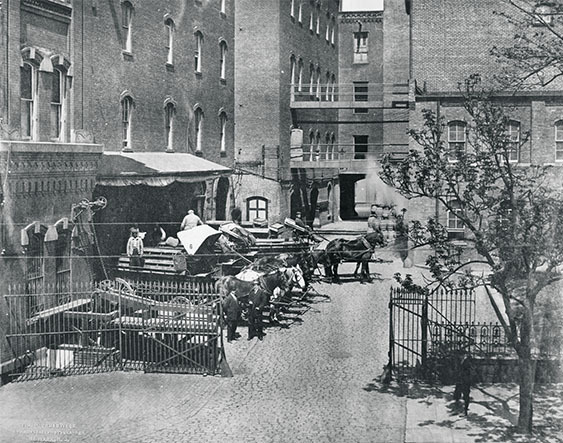 As early as 1852, Joseph Hensler's brewery was producing fine beer for Newark's German population. Thomas Morton bought out the High Street brewery of Amos Cummings. In turn, a Scotsman from Albany acquired the firm, establishing the world-famous P. Ballantine Co., first located on River Street (McCarter Highway), and later relocated to Ferry Street. By 1954, Ballantine's had become Newark's largest employer with more than 4,000 workers producing in excess of 5 million barrels annually. Another giant industry that developed in the Ironbound by 1850 was Murphy Varnish, possibly the best varnish made in America. The Murphy Varnish Works still stand on Chestnut Street, on the edge of a forest of modern townhouses, a testament to the importance of the company and the industry. Varnish made in this elaborate factory building was equal in quality to that previously imported from England. The architectural features of the building in which the varnish was produced are more impressive than most 19th century American factory buildings. Today, the company is gone, but Franklin Murphy, the industrialist and former New Jersey governor, is remembered. Closely associated with the Newark varnish makers were the paint manufacturers. Today, one of the most prominent is Benjamin Moore, located along the Passaic River. It is housed in one of the largest buildings that can be seen from the PATH train to Jersey City or New York. As one of the Ironbound's largest employers, it is one of a long list of past and present companies that made Newark the paint center of America. Others include Sherwin Williams, Beckwirth-Chandler, Cook and Dunn, Flood and Conklin, Maas and Waldstein, Security Paint and Varnish, Vita-Var, Duralock Chemical Corp., and Tribault and Walker. In addition to beer, paint and varnish, the Ironbound's chemical industry is of great importance, too. According to Bill Chinourd, executive director of 'The Ironbund,' the development of this industry cannot be underrated in a general assessment of Newark's manufacturing importance. Serving the chemical, general manufacturing and commercial needs of the East Ward, Chinourd's 'Ironbound' agency was founded in 1994, replacing the old Ironbound Manufacturers' Association. The new agency fills many of the functions of the previous one. However, it has taken on new responsibilities as well. One example is in its HASMET Program, designed to register potentially dangerous substances stored in nearby buildings. In case of a chemical accident, appropriate authorities can be contacted if there is a fire or explosion. The correct type of response to the emergency can be determined based on the information stored in a computer shared by 'The Ironbound' and the University of Medicine and Dentistry of New Jersey (UMDNJ). At present, registration is not nearly complete. More money is needed for equipment, and staff training must be continued. Yet the HASMET Program is off to a good start as far as manufacturing safety is concerned, a factor which has pushed UMDNJ, 'The Ironbound' and the City of Newark into a favorable national spotlight. In the Ironbound, the past, present and future are intertwined. The vitality of earlier years is alive today in the streets, factories and businesses of Dutch Neck, Down Neck or the Ironbound. The cast of characters has changed; the types of products manufactured are different, and the modes of transportation are new, but the goal is the same: A better life for the area's residents. Throughout the Ironbound, hundreds of townhouses are being built, old factories are being updated or converted, and shops are displaying goods and products from home and abroad. The Portuguese bakeries, owned by the Texeira, Coutinho and Viera families, and regionally famous Portuguese and Spanish restaurants feed diners from home as well as serve as a tourist mecca for the city in general. Last June, during Portugal Day, a half-million people found that the Ironbound was a good place to visit. So, come down to the Ironbound. It's a good place to do business and live.